Everyone has a story. Each one is valuable and each one is unique. 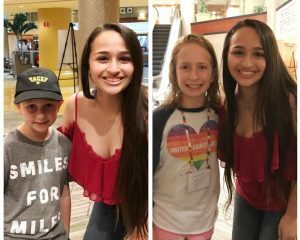 Many people know Jazz Jennings by now, but if you don’t, I hope you take this chance to learn about her remarkable life. Her story has empowered millions of children and adults alike. Jazz is a young transgender woman who has become a leader for the LGBTQ community. Along with co-author Jessica Herthel, Jazz wrote a children’s book about her experiences. I Am Jazz is a way for young people to not only learn about a trans child’s life, but to discuss the value of all differences. Recently, a video of people in our county reading I Am Jazz was shown in several schools and communities in Southeast Michigan. The video included two of our own kids, Sydney and Jacq Kai, ages 12 and 10. One district in particular recognized that its students would benefit from learning more about its transgender and gender-diverse population and arranged to show the video in its elementary schools. The readings generated opposition by some parents, including a petition. There is still much confusion about what it means to be transgender. The purpose of Jazz’s children’s book and the readings is to share one transgender child’s experience and hopefully open some hearts and minds. I used those very words when our family went public with the story of our transgender son almost three years ago in support of the Michigan State Board of Education Guidance for LGBTQ students. Any time we do these readings, we expect questions – and some tension. Tension ensues whenever we challenge the status quo. And it’s a reflection of the level of understanding we have as a society. I wish we were at a point in our society that we didn’t need to share our story publicly. But we aren’t there yet. Many people are simply not aware of all the work by medical, mental health, social work, and educational professionals, and the best practices that are in place for our transgender kids. And of course, it’s difficult to walk a mile in someone else’s shoes and really understand their experiences – that’s true for all of us. If we don’t share our stories, our children’s experiences and struggles are subject to misinterpretation. Misinterpretation can lead to fear or anger, and sometimes violence. Every year we lose too many people to hate crimes, especially transgender people of color. And every year we have too many children who are forced to conceal who they are and succumb to depression and other mental health problems. But it doesn’t have to be this way. The most comprehensive longitudinal study conducted to date shows that children who are supported in their gender identity have mental health outcomes similar to the rest of the population. The opposite is also true. Kids who are not supported have a very high risk of depression, self-harm, and suicide, because they cannot live in a world that doesn’t accept them – or a world that actively tries to erase them. The more our kids are forced to hide who they are, the more dehumanizing the effects will be. As human beings, one of the simplest and most effective things we can do to understand one another is to tell our stories. While I’ve come to expect the tension – and even embrace it – some of the reactions can still be discouraging. This reading of a children’s book, a child’s experience, was denounced as a liberalist agenda and a threat to some people’s faith. It was called scientifically inaccurate and an unnecessary waste of school time. And worse. Ironically, reading stories about other children’s experiences is one of the best uses of our school’s time. If we expect kids to learn and work together, they should know something about each other. The value of reading about African American children and the Civil Rights Movement is immeasurable, as are stories about Native American children and children of different faiths and cultures. Stories that give a glimpse into the lives of children with physical, learning, and mental health challenges, or kids on the autism spectrum. Stories about kids growing up in single parent homes or who are adopted. Stories about people in the majority and people in the minority. And stories about LGBTQ families. When kids graduate, they will discover the majority of companies are strong advocates for the rights of our transgender and gender-diverse population. One has only to look at the number of companies publicly supporting these rights and at their policies of diversity, equity, and inclusion. If our schools want to prepare kids for the real world, they better start educating them about gender identity now. Our son’s experience is similar to that of Jazz. Gender identity is of course completely separate from sexual orientation, and it forms over time, generally from age two to five. We learned it is not uncommon for transgender kids to show gender dysphoria during that time. This has been shown by a University of Washington study and it is what our family and many others have experienced first-hand. Our son was assigned female at birth but began recognizing his assigned gender didn’t match his identity when he was around two. Gender dysphoria itself involves a comprehensive diagnosis. Our family obtained the opinion of medical and mental health experts. Gender dysphoria is an intense and typically consistent, insistent, and persistent discord between a child’s assigned gender and their internal identity. Gender dysphoria is not the same as gender nonconformity. And it is not the same as your child pretending to be a dog, dinosaur, or pirate. It’s hard to put into words how despondent our son was even at a young age because of this dysphoria. I can tell you it was a matter of life and death. After we affirmed his identity, it was like a light switch. He went from despair to a happy kid who couldn’t wait to go to school. Jacq Kai entered kindergarten as a boy. We are fortunate. His principal Craig McCalla didn’t have any experience with transgender kids, but that didn’t stop him from providing a safe and supportive environment from day one. Our decision to affirm our son’s identity was made to keep him alive. I’d rather have a child who is alive and happy, than a child who takes their own life because we thought they would grow out of it. We don’t understand every aspect of gender identity and gender dysphoria, but we have enough evidence to know what works best to keep these kids alive and thriving. Being transgender doesn’t define my son, but it is a part of who he is. He embraces it. And I wouldn’t want it any other way. Frankly, he’s much more likely to tell you about his other interests, like his love for football and wrestling and science. He talks often about being a professor and an inventor – and also wants to be a lineman. That’s one thing that has changed. He had his sights set on quarterback for a while. But what makes our son transgender has nothing to do with his love for football and wrestling or other likes and dislikes. My son’s identity comes from an internal sense of who he is. Last year, Jacq Kai shared his story with his 5th grade class. Just as he’s been doing since the 2nd grade. He wants people to know and to understand what it means to be transgender. The amazing and perhaps not so surprising result is that kids get it. They have questions, but then think about their own differences and how they would like to be treated. From our experiences and those of educators around the country, kids can be taught about gender identity in an age-appropriate way in elementary school. Let’s be clear. I Am Jazz is not a textbook and it is not intended to show the broad spectrum of gender experiences nor the science behind it. It is a children’s book that provides a powerful teaching moment to give classmates a glimpse of one transgender child’s experiences. Sharing experiences is a small but important first step. Training and resources are also available for educators to provide more in-depth information and support. Every major professional organization representing pediatricians, psychiatrists, psychologists, social workers, and educators recognizes how critical this support is to the well-being of transgender and gender-diverse children. For best practices on caring for transgender and gender-diverse children, the American Academy of Pediatrics (AAP) recently updated their policy and is partnering with other organizations to provide practitioners and parents with valuable resources. It is this vast body of evidence that we follow, because it gives our transgender and gender-diverse kids the best chance to survive and thrive in this world. In spite of the opposition to the readings, I am encouraged. In fact, most of the commentary has inadvertently proven exactly why these readings are so essential. The next National “Jazz and Friends” School and Community Reading Day is February 28, 2019. We have the opportunity for on-going and meaningful discussions and more stories about diverse experiences across the spectrum. I am humbled by the many brave educators, parents, and allies who have stood up for our transgender and gender-diverse kids. It seems our educational system is always on the front lines for kids in the margins. When we create safe and supportive learning environments for the most vulnerable, every child benefits. My kids read about Ruby Bridges and other young pioneers in the Civil Rights movement. They read about kids from all walks of life. And I think it makes them better humans. This is the power of storytelling.